ISLAMABAD The strategic importance of Pakistan is obvious, but it is not exactly a blessing on the land. In an interview here this week, President Pervez Musharraf said the country lies at the nexus of five world concerns: terrorism, democracy, human rights, narcotics and nuclear nonproliferation. He might have added the widening gap between Islam and the West. In this planned government city of broad avenues and tight security, a gracious if sterile comity prevails. A Pakistani journalist told us the local joke is that Islamabad is half the size of Arlington National Cemetery and twice as dead. But nearby Rawalpindi teems with commerce: overladen burros; precarious, wildly painted minivans; old men in beards and robes drinking tea. There are no women in sight. Banners hang everywhere - right along with those cheering Pakistan in the cricket championships - proclaiming (roughly translated by our guide): "We are defenders of the Prophet Muhammad's respect and prestige, and if by doing this we are called terrorists, so be it." Or, more succinctly, "Death to Denmark." Their Muslim identity has profound meaning for many Pakistanis. The name of the country, after all, is the Islamic Republic of Pakistan, home to 148 million Muslims, 97 percent of the population. The direction of Mecca is carved into the hotel room wall. An international group of journalists on a study tour of the region was told repeatedly that the list of Muslim grievances with the West is getting longer. There is a strike, boycott, or demonstration against the "blasphemous cartoons" called nearly every day. The cartoons are merely the most convenient flashpoint. Government officials and opposition party leaders alike complained to us of rampant Islamophobia. They complained of a double standard applied to Iran's nuclear ambitions when North Korea is just as much of a threat. They complained that President George W. Bush is spending five days in India on his visit to South Asia next month and not even an overnight in Pakistan. The situation is not made any easier by a per capita income of less than $800 and a literacy rate of roughly 50 percent. The devastating earthquake in October actually served to ease some tensions by bringing the international community together in the relief effort, but the reconstruction challenge is huge, and refugee camps in Islamabad are in danger of becoming permanent. In this volatile landscape, Musharraf, the general who seized power in 1999, walks a fine line. After the Sept. 11 attacks, he made the crucial decision to back the U.S. war against the Taliban in neighboring Afghanistan. Foreign investment from the United States followed, but the partnership with America is still unpopular in much of the country. For domestic consumption, Musharraf rails against the United States, condemning January's U.S. drone attacks in the borderland area of Bajaur as a violation of Pakistan's sovereignty and calling the Danish cartoons "sad and pathetic." But he is also keen to show the West that he is slowly restoring the institutions of democracy. He touts a free press, a vigorous civil society and an increasingly vocal Parliament (assertions scoffed at by members of the press and opposition parties we spoke with). He is gingerly reforming the madrassas, or Islamic schools, and promoting free trade and even tourism. His aides say the only thing about him that is not democratic is the fact that he wears a uniform. In advance of the Bush visit, Musharraf and his cabinet said the United States has a responsibility to resolve the political disputes that prevent the Muslim world from prospering. Chief among these is Kashmir, the beautiful and beleaguered territory that India and Pakistan have fought over for decades. Musharraf said, "I believe at the moment Kashmir is ripe for a resolution." But he didn't mention the best resolution: Kashmiris themselves deciding their fate in a free referendum that includes the option of independence. And with the United States binding itself more closely to India, it is unlikely Bush will take the Kashmiri bait. Pakistan's is still a fairly new political system, so the roles of religion, civil society, the military and local governments are still being worked out. But prodemocracy forces are getting impatient, and religious fervor is on the rise. Musharraf likes to call his strategy of bridging the Muslim world and the West "enlightened moderation." But the metaphor of the earthquake - an unstable land of fault lines bracing for aftershocks - is the more appropriate description. Whoever discovered the utility of cartoons, published months ago in some Denmark newspaper, may be amply satisfied after the death, destruction, looting, burning and pillaging that have resulted. If the purpose of the rioters, however, was to harm the US or the West, then they don’t have a clue about international politics. As a matter of fact, to the dismay of many enlightened people, the cartoon riots may have benefited both the post-9/11 adversaries — the US and the religious fundamentalists. And even if some in the Musharraf regime may be secretly giggling over their cartoon-enhanced importance in the Western world, the controversy has significantly pushed Pakistan back in achieving economic and political goals. The way President George Bush and Secretary of State Condoleezza Rice have been condemning the violence speaks volumes about their real intent. If the US was worried about the Muslim reaction, Dr Rice may not have continued accusing Iran and Syria, at least for now. On the contrary, she was working overtime to malign these two countries, accusing them of whipping up cartoon violence, without providing any proof. It simply meant that instead of talking to the Muslims, she was telling the Europeans “didn’t we tell you so”. For her, even at the expense of the Muslims, winning European support for a future Middle East venture was essential. For the US, the Europeans are the most important allies in every venture. The alienation of many West European countries, due to the Iraq war, was considered a major US foreign policy setback. However, the scarf controversy in France and the cartoon violence against the Scandinavians, have helped lessen the widening cross-Atlantic differences. Particularly since differences may have resurfaced in dealing with Hamas. Most interestingly the cartoon violence broke out after the Hamas victory in Palestine: the Europeans, specifically, Scandinavians, were the ones who would have continued their assistance to the beleaguered Palestinians. Now the chances of European help for entities like Hamas are minimal. They have moved much closer to the US approach to Middle East. The marvellous discipline shown by the US media, in not reprinting the cartoons, was also very significant. Even Reverend Pat Robertson, the career Muslim hater — who has made inflammatory statements about Prophet Mohammad (PBUH) on his TV channel — has maintained silence. Probably, the entire fundamentalist Christian Evangelist movement — inside and outside the US government — understood the game i.e. let the Europeans fight out the Muslims, for now, while the Americans sit pretty. There is clearly much more unity between America, Israel, and Europe after the cartoon violence. The US is now in a much better position to put together a broad alliance against Iran. France, a staunch opponent of the Iraq war, is almost spearheading the anti-Iran crusade. The cartoon affair may not have authenticated the ‘War of Civilisations’ but the cultural conflict has assumed much broader dimensions. 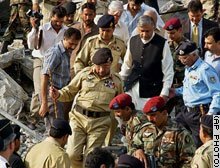 Pakistani security forces’ kid-gloves approach towards the rioters in the first few days of demonstrations raised suspicions that the Musharraf government was behind the violence or was encouraging it. The critics alleged that, in this cynical game, the Musharraf government’s purpose was to show the US and its Western allies that the extremist forces in Pakistan are not the military’s imaginary creations but real, well and alive. The critics also compared the security response to the demonstrations with the deployment that made for the arrival of Shahbaz Sharif and Asif Zardari, leaders of mainstream parties. It is alleged that the government is much softer on the religious parties than on Pakistan People’s Party (PPP) and Pakistan Muslim League PML (N). Even women belonging to the PPP were not spared at the demonstrations. Therefore, Musharraf’s detractors are convinced of the government’s complicity in the present upheaval. There are equally strong arguments in the government’s defence. The upsurge, argue the government’s supporters, was spontaneous and unanticipated so that the security forces were not prepared for it. However, after the first days the demonstrations were dealt with very sternly. They also ask why the Musharraf government would embitter the atmosphere a few weeks ahead of President Bush’s visit unless it is trying to find an excuse not to receive him? Whatever the Musharraf government’s strategy in dealing with the crisis and its enhanced anti-terrorist positioning is, no foreign investor is going to think of Pakistan for some time now. The newly demonstrated might of the jihadis is also going to push Musharraf closer to them to safeguard his personal interests. He will further distance himself from the mainstream political parties and the restoration of a genuine democratic process will be severely undermined.